Check out the very latest updates and features. Last week we introduced a new feature called 'Messages' that will further enhance your communications with clients and streamline your notification process! Now, you can save multiple email versions or templates for use with the Send Link function. 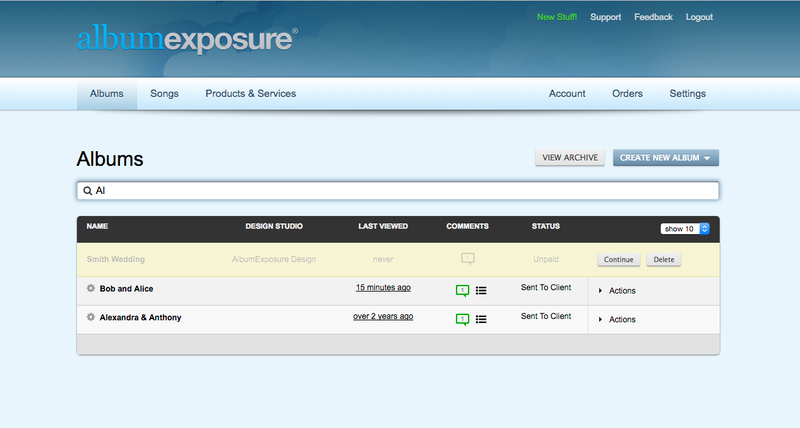 This way, you can customize your messages based on client type or depending on where the client is in the process. Your communications will be on point for all client situations! You can conveniently create new messages from the Send Link page within an individual album or from the more global Messages page that's accessed from the top right user menu. Creating new Messages is super easy! 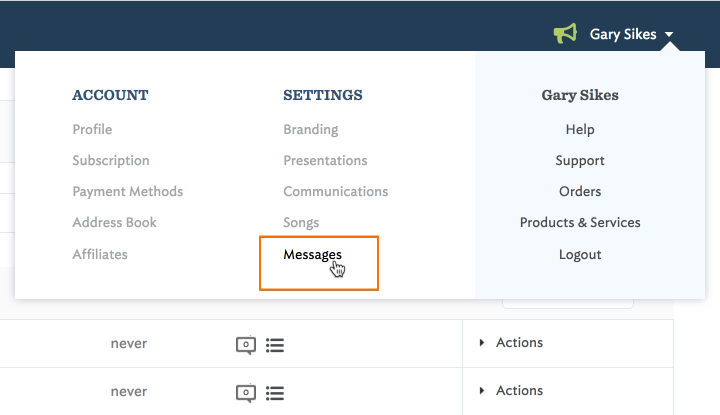 When you select to create a new message, you'll see an overlay window (on the Send Link & Communications pages) or the following layout on the Messages page. Give the new Message a Title (only seen by you), Subject (will be the subject line of the email sent out), and edit the sample text as desired. Pay close attention to the variables you want to keep or add, so that the presentation link, password, or other items show up dynamically every time you use the Message. Create as many Message templates as you need and they will be organized on the left hand side of the Messages page in alphabetical order by title. 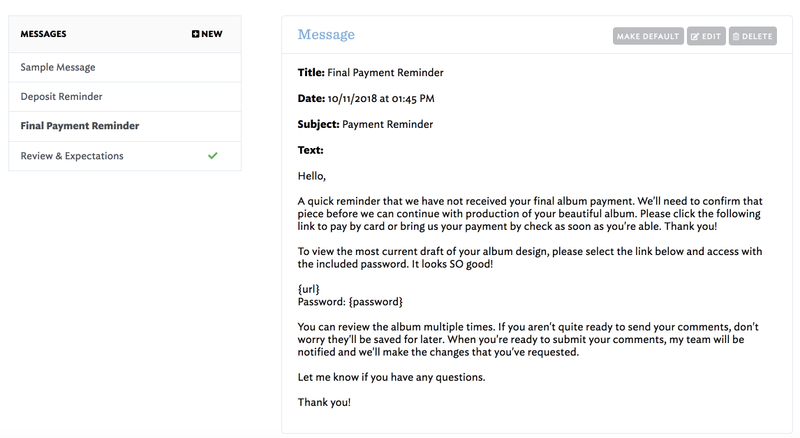 You can also edit, delete, or select which Message you'd like to appear as the default on the Send Link page for each album. No matter what you choose as the default, you can select any message as needed when sending to your client. At times in your album workflow, it can be helpful to get a little more intentional with clients. This can certainly be true when clients complete the proofing process and seek to approve their album design. You naturally want to be confident that your clients are sure of what the design approval means. Making the approval step more comprehensive should clarify expectations for your clients and provide additional protection for you from potential misunderstandings. As a result, we've released a new enhanced client approval feature! It's available as a global setting option on the Communications page, accessible from the top right user's menu. When selected, this option will replace the current browser failsafe method that shows after a client selects to approve their album. While the current method provides a solid message and offers a clear confirmation step, we know that some of you desire more. The upgraded client approval step includes more comprehensive messaging and a digital signature requirement. 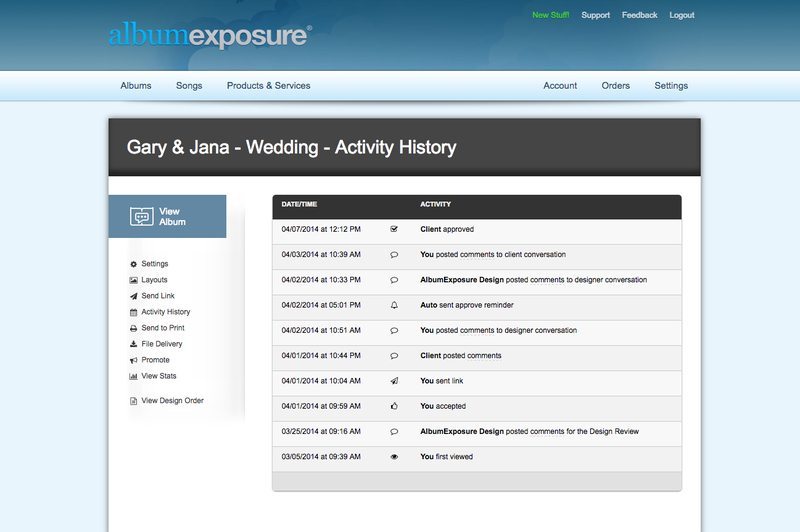 Once signed, you can reference the client approval at anytime from the main Albums page or album's Activity History. Your client's signature approval includes your client's name, time/date, and an IP address, as confirmation of the digital signature and you can even print the full confirmation details to include in a client's job folder or to present in case a disagreement arrises. NOTE: Our lawyers insisted that we can not allow the copy in this section to be editable, due to issues with contract law and limited liability of third party platforms. Basically, any legal documents you present to clients should be crafted by a licensed attorney and provided to your clients directly (not through a third party platform). We know that's not ideal, as we'd like to do more for your workflow, but we aren't attorneys and can't avoid their recommendations. We are certainly open to revisions for improving the content for all users, so if you have any thoughts, please let us know and we'll consult the legal team :). This month, we've made several updates to make your life easier in the proofing process. If you're offering the unique and fun calendar style albums to your clients, which have a horizontal spine that flip up, now you can better represent those in the proofing process with our new flip up animation. This provides a more realistic presentation for these types of albums and improves your client's experience. The default setting will continue to be for standard albums, so the selection above will remain 'unchecked' unless you need it for that album. Sometimes it's helpful to know what you wrote to your clients in the initial Send Link email or if you resent that email at any point, especially if you edited the content to include pricing or other terms. From the Activity History, it's now easy to reference this message content at any time. Look for the paper airplane icon to indicate when you've sent a message to your client and then move your cursor over 'message' to see the details. One more way to keep all your communication for an album clear and organized. A few weeks ago we moved the new versioning feature out of beta for full release! 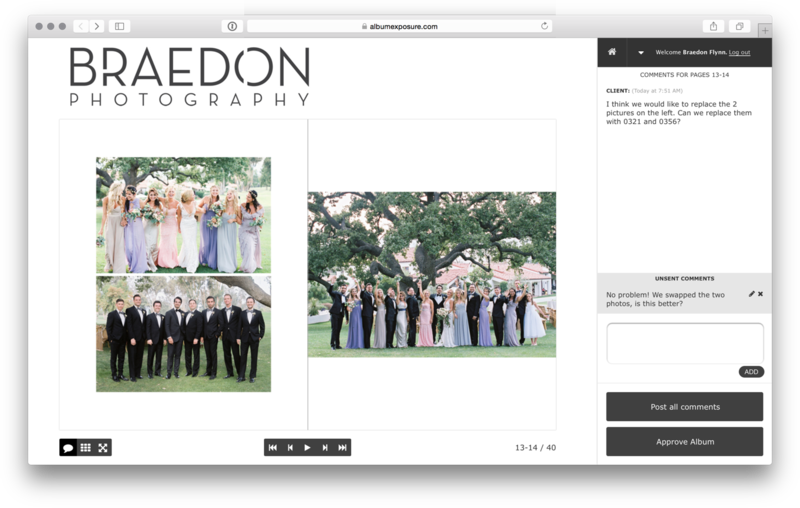 Now, you can consider creating a new version of an album anytime that you believe it will help clarify the proofing process for you or your clients. NOTE: New versions are always created on the Layouts page for the album. 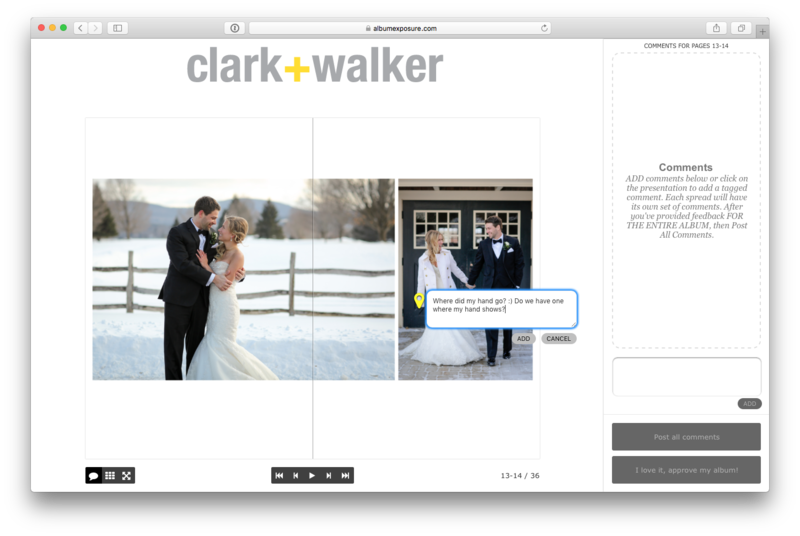 Versions can be viewed on either the Layouts page or in your Album View. 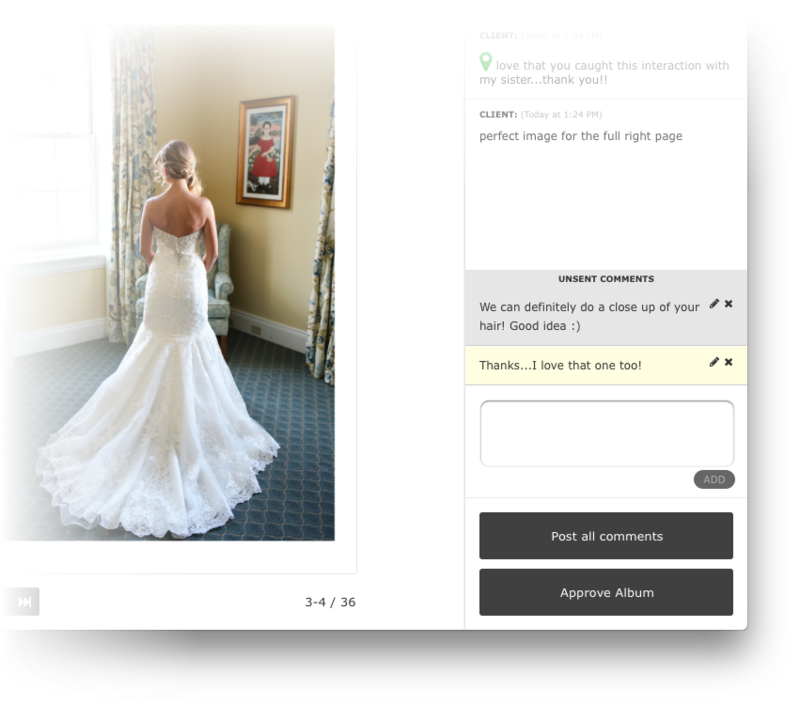 When accessing versions from the Album View or the Client Presentation, you and your clients will now see above drop down selection menu at the top of the comment area. With multiple versions, it's easy to track changes as they match with rounds of revisions. 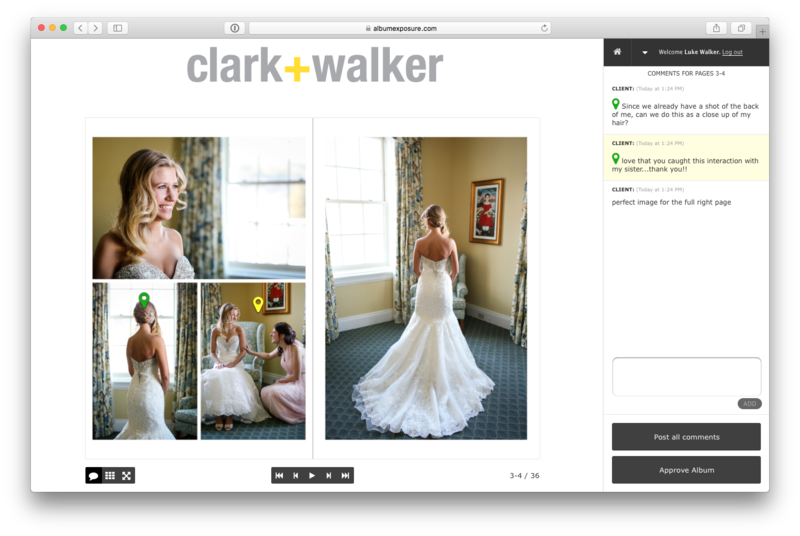 Both you and your clients can refer back to old versions or view the entire dialogue for an album, giving you the optimal flexibility to manage the process as easily and clearly as possible. This morning we launched an updated look and feel for your AlbumExposure account! We know many of you were comfortable with the previous style, but it was time to update the wardrobe..if you know what we mean. This redesign is also a precursor to several new features we think you'll be really excited about. First, a super clean and easier to navigate Albums page. And...as the primary page in your account, please be aware that no matter where you have navigated, you can always get back to your Albums page directly by clicking the AE logo in the top left corner. Secondly, you'll see that the primary page navigation has been nicely reorganized to the top right corner. Note that there is a new link in the navigation called 'Help'. More to come regarding this new page, but we're building a complete knowledge base that can provide 24/7 support for any questions that might pop up. Lastly, we've moved the View Album button just slightly. Rather than appearing at the top of the subnav on the left hand side, you'll now find the View Album button in the album title bar. It is still present on every page within the album, so it's always easy to view the album and comment dialogue. 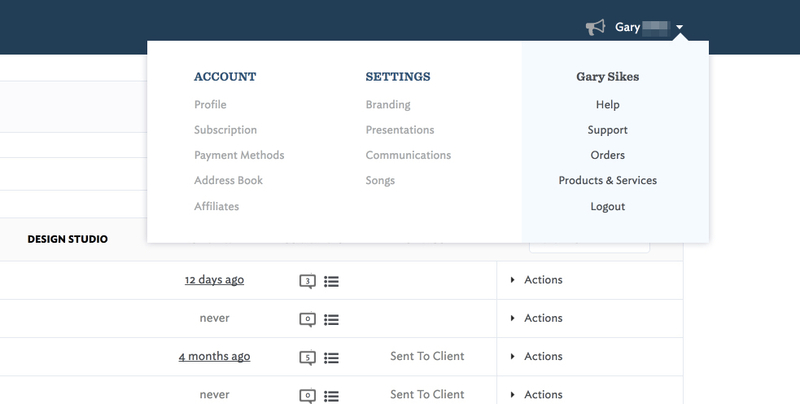 Client reminders now feature recurring options! We all have times that we need more than one reminder, right?! This is especially true for clients, who don't always respond to the first reminder regarding their album design ;). To keep the proofing process flowing and make sure you don't have keep up with your clients manually in the workflow, we've added recurring reminders. When selecting the settings for an individual album or accessing your account level communication settings, you'll now see the ability to set recurring options. These options include a starting reminder, the ability to repeat that reminder (every 2, 5, 7, or 14 days), and a number of times to repeat (1,2,or 3). This is a great way to let the software work for you and keep the process rolling without having to think about client follow ups. Introducing AlbumExposure Design with Integrated Proofing!! 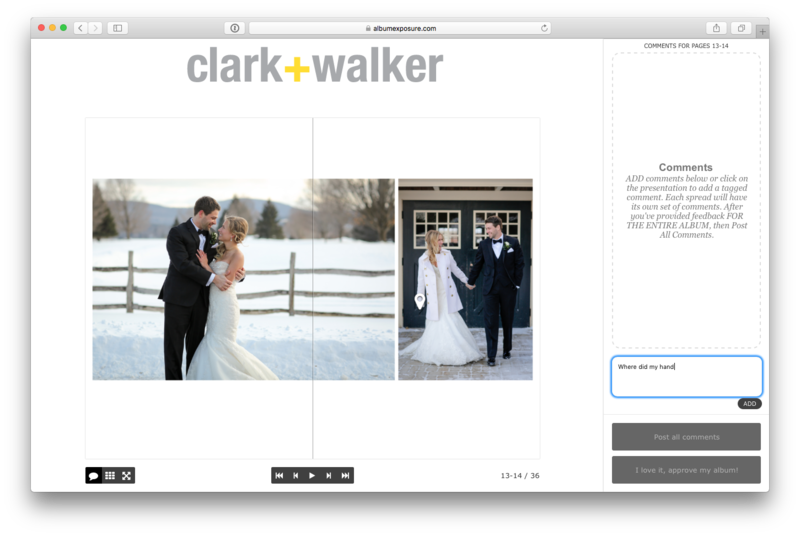 Now you can shoot, design, and proof in one very smooth album process. We've crafted our design software to be completely flexible to meet your needs. It can be quick when you want it (with our auto-design feature) or you can control the fine details when you need it. No limitations, just beautiful album designs and a workflow that 'works' for you. 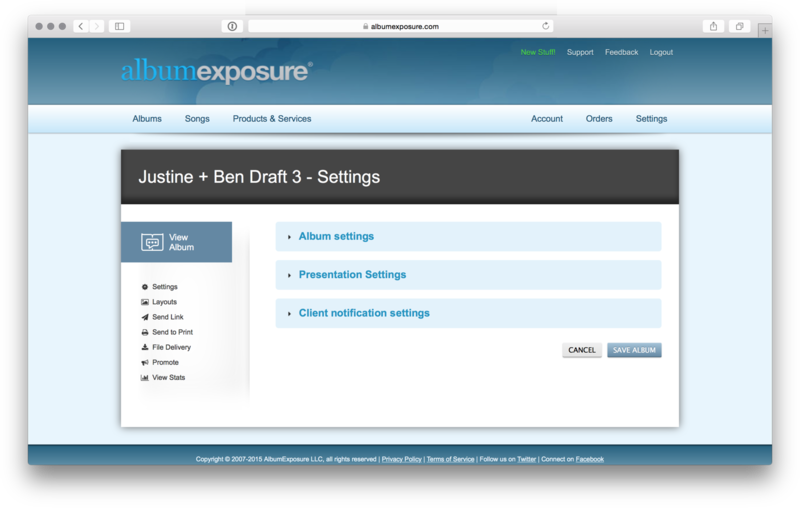 Learn more about AlbumExposure Design - and make sure to TRY it FREE for 30 days! You'll also find access to our brand new knowledge base from the Help menu. We hope it's one more way we can serve you well as you get started with the new design software and continue to shape your perfect album process. Let's go design and proof some beautiful albums! 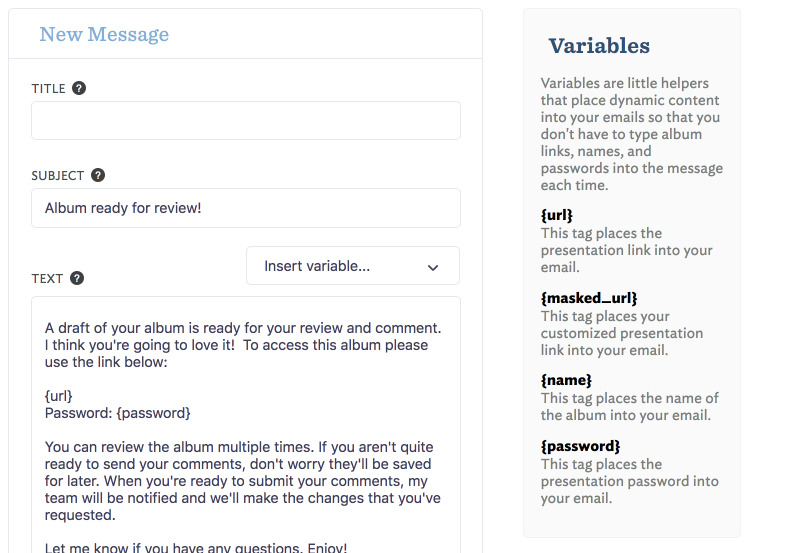 A lot of new features and account improvements to catch you up on, so let’s jump right in! In the past we’ve included a Proofing History on the Settings page to highlight some of the main movements on the album, but we wanted you to have more detail in order to document the entire process. So, we’ve included a full Activity History for each album that tracks every action on the album. This way, you can always reference what happened and when. You can also roll over the comments for a quick view of that specific round of comments which were made or received, in the order they were made on the presentation. Your Albums page is now more easily managed with the addition of global Search. Simply pop in the name or partial name of an album and your Albums list will automatically filter to help you find albums more quickly. 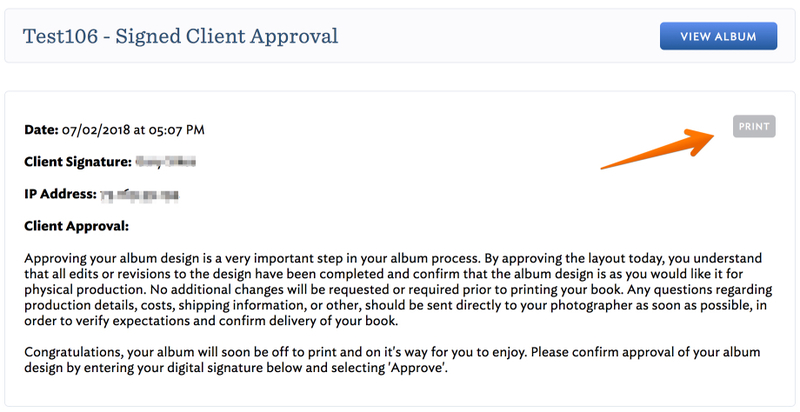 Photographer accounts can now Reset Approval for an album. 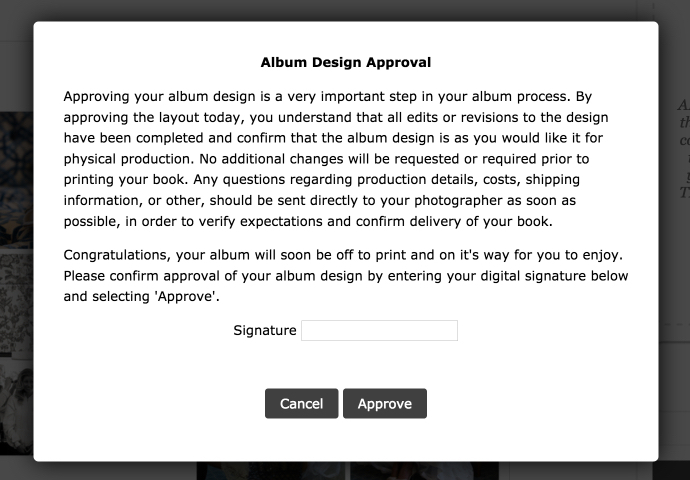 So, if your client accidentally approves the album and needs to continue the proofing process, you can quickly reset the approval from the Actions menu on your Albums page. When an album is reset, this will be reflected in the Activity History, so you can easily track this progress. This is definitely a feature you won’t want to use too liberally, but will be nice to have when those mistaken approvals happen. While everyone loves the new presentation interface, many of you mentioned that you missed the old comment list, which allowed you to see the list of comments for the album on a single scrolling page, rather than needing to flip through the album presentation. So, we’ve introduced a new List View for comments as an alternative to diving into the full Album View. Just another management option to help you shape your best workflow. Quick Tip - click on the thumbnail in the new Comment List View to see it full size in a convenient overlay. Lastly, you now have more flexibility within archived albums. You can see the full Album View and comment histories for an archived album without needing to restore it first. This way, you can easily reference archived albums, while still keeping them ‘closed’ from viewing for clients who had the presentation link previously. We are beyond excited to release this update for you! You and your clients can now comment directly on the presentation with our tagged comments. You can still make general comments in the comment area, but this allows for a higher level of clarity whenever it’s needed. You can also start a comment in the general comment area, and continue that comment as a tagged comment if it needs the extra level of detail. New rounds of tagged comments will show in green to signify they require your attention, and while previous tagged comments are removed from view for less distraction, they are easily referenced. Highlight the comment in the comment history and the tag will appear. 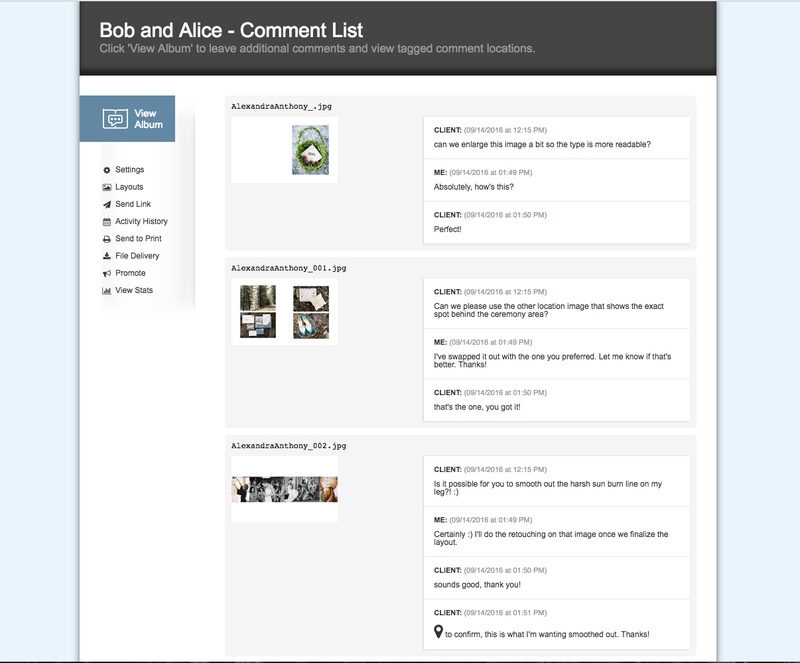 A secondary feature update, is that you can now have multiple comments per spread posted at the same time. This provides a way to separate different trains of thought and bring additional clarity to the communication. Tagging makes it easier to communicate, and saves time from any potential misunderstandings. We know it's something you've been asking for, and we agree it’s going to make proofing that much more efficient and enjoyable. 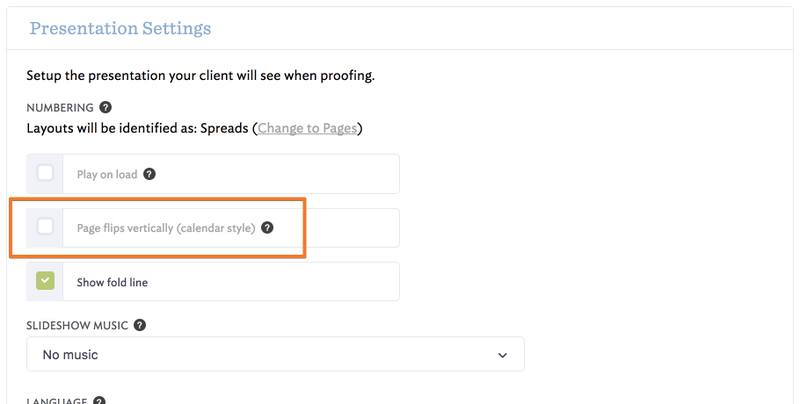 Another great feature to make proofing a fantastic client experience! We have another big update that we know you're going to love! 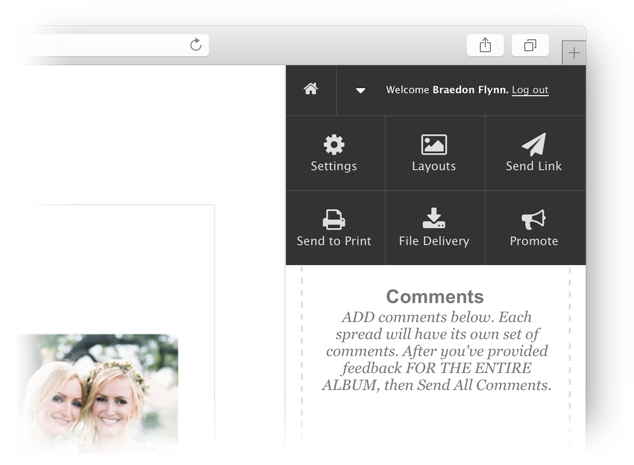 It was time to retire the Preview and Comments pages and unify them in a brand new Album View! The new Album View streamlines the process and makes communicating on spreads a breeze. 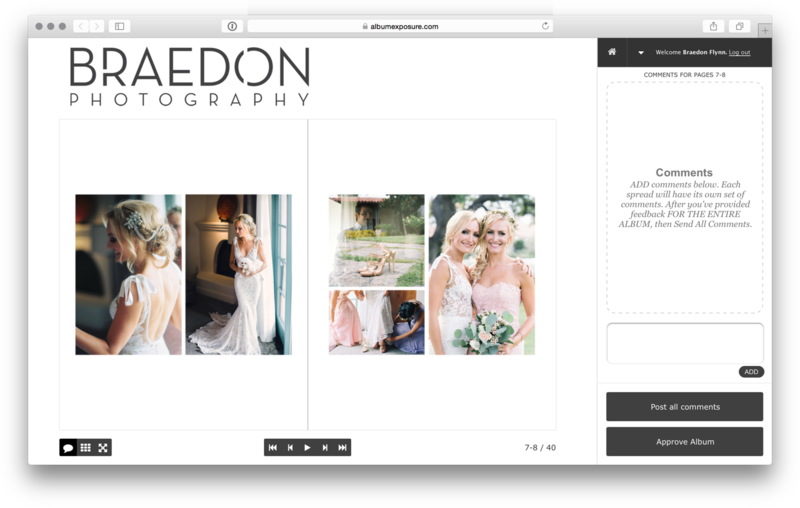 The 'wow' factor we recently added to client presentations has been integrated into the new Album View so you can always view the album at it's maximum size. Plus, you're always seeing the same thing as your client, which creates very nice consistency with your client experience. You can now see the album at it's maximum size and leave comments at the same time! The comment interface is far more intuitive, streamlining your conversations on spreads and saving you time in the review process. The Album View is easy to find when you're in an album and we've also improved the secondary navigation. And when you're looking to find your way back to your Albums page or another part of the album menu, we have a new navigation in the Album View that helps you go where you need to in one easy click. 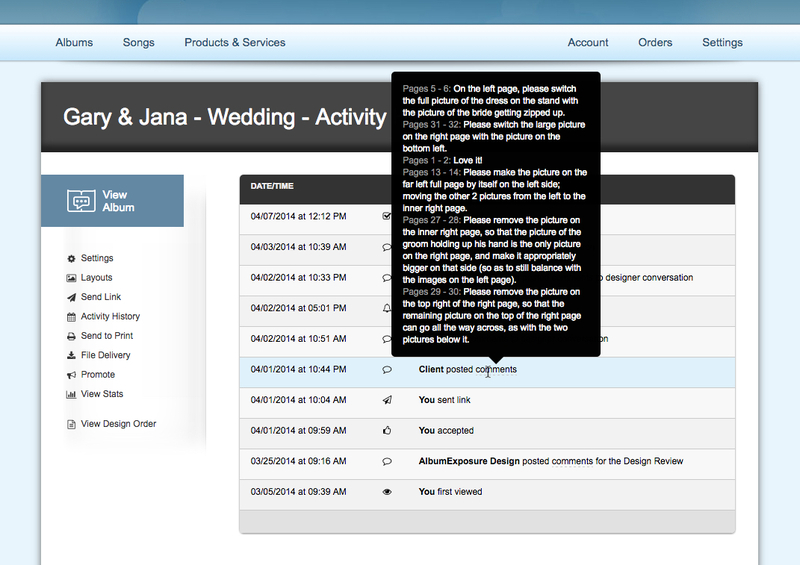 Another feature to bring you the very best proofing experience and improve the ways you communicate with your clients! Click into thumbnail view and you'll see the number of comments made on each spread. Even better, you'll see the most recent comment requests from your clients lit up in green. This way, you never have to go spread to spread when you only want to skip directly to the layouts that need your attention. Another feature to make the process more efficient as well as improve communication between you and your clients while proofing. Bigger, bolder, and more beautiful presentations! We've made an update to presentations that you and your clients are going to love! Presentation images now resize to take advantage of the maximum amount of screen real estate and provide that 'wow' factor for your client. It's smart (responsive!) too, loading the best sized image no matter what screen your client is viewing their album on. It's always going to load as quickly as possible and look beautiful. When it comes to showing off your beautiful album designs, we agree that bigger is better! Today we've released a brand new presentation and comments interface! Not only is it a wonderful upgrade to the overall proofing experience, but it also lays the necessary groundwork for new features to follow. Many of you have been looking forward to these updates and we think you’ll really enjoy the results of our team’s hard work. We look forward to hearing from you and continuing to build the best album proofing solution in the industry. First, we've added added a status column so that you can see what step of the proofing process an album is in with a quick glance. If you've purchased an album design from us, you'll also see that pending album at the top of your album list in yellow while it's being designed. If you work with a Design Studio, you'll appreciate that all of your albums are now in one table. Design Reviews that require your attention before sending on to your client will also appear highlighted and at the top of your list. If you're on a free account, we've added slots for albums available in each category, so you always know where your account stands. We hope the new albums table makes it even easier to manage proofing albums with your clients! Feeling a bit behind or bogged down with album designs that need your attention? Or just want all of your album process in one place? Well, we’re here to help! You can now purchase album design services right from your AlbumExposure account! Click on “Create New Album” then select “Buy a Design” to get started. The design style we offer is clean, classy, and modern, which we feel allows the images to really pop and makes for a timeless result. Feel free to catch up on other things while we go to work on creating a beautiful album design for you to review. Learn more and see design samples on the Design Service Page in your account. One great feature in AlbumExposure has always been the ability for you to customize the URL in order to make everything on the client side look like it’s coming from your website. 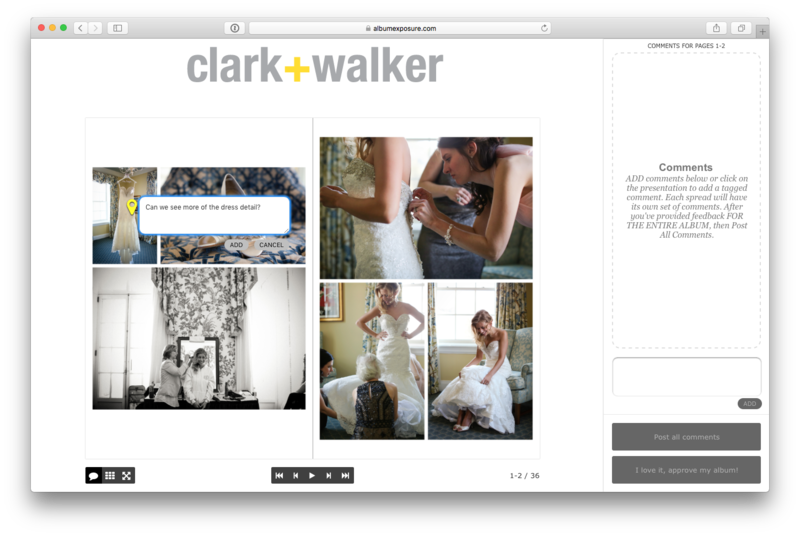 This way, when your clients log in to view their album presentations, it will be all about your brand in every detail. It has always been our goal to help you keep your brand in front of your clients as much as possible. Today, we are introducing a new method that is easier to setup than the previous one, more accessible to all of our users, and offers higher functionality. Some of you didn’t have access to your server files, which was previously required, so the new DNS customization method will make it easier to setup via your registrar or host. You'll also have the ability to link directly to an album when using your custom domain and can send clients on a more direct path to their albums. If you’ve set up masking previously or if this is your first time, you can either view a quick video on our tutorials page or follow along in our knowledge base. Please let us know if you have any questions during the setup, we’re more than happy to help get you dialed in with your custom domain!